The Lifehack team has had the delight of following Fran ‘A-MAZING’ McEwen since she first joined us for last year’s Fellowship. Shortly after the Fellowship, Lifehack ran a programme called Te Kōanga, which stands for new beginnings or spring in te reo. For Te Kōanga, she brought along her team mates Katie and Chloe from her newly launched project Shift. They had the idea, some funding and were keen to work what was possible to creatively encourage young women to increase their physical exercise whilst paying attention to their wellbeing overall. We had the amazing opportunity to catch up with Fran and the team at the Shift Jam, a short and sharp programme aimed at bringing across the main principles behind social entrepreneurship and human-centered design to young women, so they can take those skills to get their own projects off the ground. All of this happens in a space of trust, playfulness and mutual support. Rachel Knight, Shift’s lead designer, has written some reflections on what she’s learnt from the project to date. Below is an excerpt from her blog post—you can read the full version here. Planning a jam is a breeze when you do it with a pro-active team. Your jam values should be present in all parts of the programme. If you talk about nutrition, serve nutritious, locally grown food. If you talk about physical activity, do a dance session. If you talk about social enterprises, purchase collateral that showcases this. Walk the talk to show them how you can. The vibe of a weekend is quickly set by the vibe of the space you’re in. Kate taught us about the three different facilitator roles; head, heart and hands. Head is someone delivering meaty content for participants to think about and work on. Heart looks after individual wellbeing, moments of reflection and team bonding. Hands looks after logistical factors like timing, space and food to keep the jam running smoothly. ‘Kawa’ sessions set a team vibe from the get-go by co-creating the group’s behaviour expectations. You get the group to brainstorm what they expect from themselves, the group, the programme, and the facilitators for the weekend, before reaching an agreement and signing the page together. Speaking on the second day of a jam is a lot less intimidating because the participants become people you know rather than a sea of faces. Flexibility is key. We were tweaking times throughout most of the weekend — not because we hadn’t thought about timing enough, but because so much depends on the group on the day. Include time buffers. Teenage girls are way nicer and more on-to-it than I remember them being in my teen years. I love meeting super-cool humans who introduce me to other super-cool humans. Through meeting the mentors, I realised that there are so many people working on amazing projects in Wellington. The challenge is to connect them to make an organised, collective impact. Energy. This jam wouldn’t have been half as successful if it wasn’t for the team’s goofy and loveable enthusiasm. People like Katie and Fran bring a level of energy that is deliciously infectious and makes the group feel at ease. Teens are fast learners. It’s amazing to teach them concepts like ‘prototyping’ and hear them confidently using the word the next day. The word ‘jagon’ is jargon in itself. I don’t need to do, and be, everything. Chloe has an extremely high emotional intelligence; she connects quickly and deeply with people, and can talk openly about what she admires in them. I’ve always struggled with this kind of thing — and am trying to get better — but I’m never going to be as good as she is. And that’s ok. That’s what you have a team for. A team shouldn’t just be a group of people who can do things together; it means understanding each other’s key skills (and weaknesses), delegating relevant responsibilities, and trusting each other in their individual roles. Knowing when to pass on a responsibility to someone who can do it better (and will enjoy it more) is just as important as doing your part. Building a safe, connected environment at a jam is key, and should be prioritised in the programme. Shift is about empowering young women, but the reality is that it also empowers all that are involved in the process. I’ve learnt so much in the past six months about: myself, working well in a team, design, wellbeing, positive projects in Wellington, mentoring, business, social entrepreneurship, and events. I’m more thoughtful, and more connected. I am way, way, way less co-ordinated than I remember being. Plan time for unplanned moments. Some of my favourite memories of the jam were in the in-betweens; bringing the girls together in the morning to look at beautiful magazines, talking about job interviews over lunch, and hugathons at the end. There’s nothing quite like the warm fuzzies you get after hearing how much something you’ve helped create has positively affected people. It’s truely addictive, and why I love being a designer. For a jam focused on well-being, I wasn’t so smart about my own. For future weekend jams, I need to book a sleep-in on the Monday morning to avoid screwing my brain into the ground for the following week. Shift has helped me clarify what my ‘Life purpose’ may be; to create relationships between people who can learn from and support each other in ways that formal education can’t. Shift is one outlet of this, but the wellbeing of women isn’t my only passion. As much as I can’t wait to be a part of the next stages of Shift taking over the world, I also look forward to new projects that create a positive impact in completely different spaces. 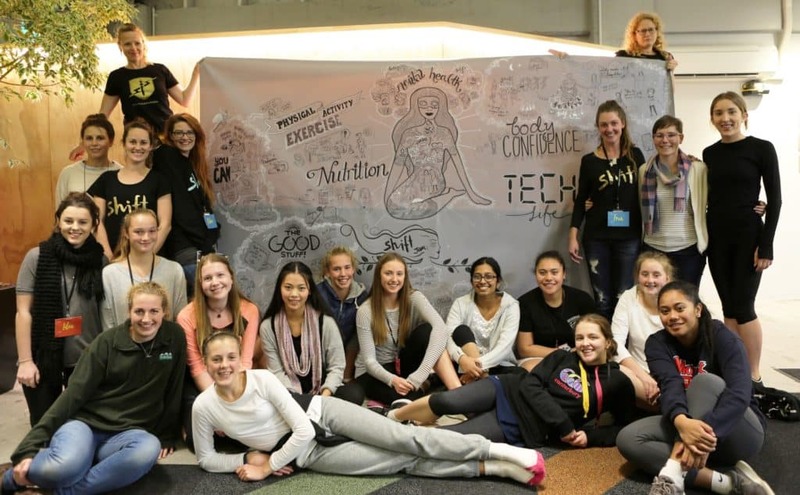 Applications for Shift Jam 2.0 are currently live, so if you know wahine between between 15-18 years who live, work or go to school in Wellington city then do pass on this link! For an impression of the last Shift Jam, check out this video. More info about the upcoming one can be found here. Read more about Rachel’s Crafty Sunday project here.